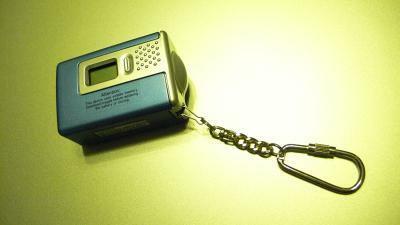 A few years ago, I wrote a review article for the Gear To Go CyberPix digital camera. I paid twenty bucks for that digital camera. But the camera was so flaky that it'd loose all of the photos I shot. I started that review article by saying, "Do not buy this digital camera!" That camera prompted me to write another article titled, "SDRAM vs. Flash Memory". For years, I looked for a twenty dollars digital camera that would satisfy my ideology. I found one. Last night, I felt an urge to go shopping. We haven't done any shopping in a while, so my wife was more than happy to comply. The only store that still opens past 10 PM was the local Wal-mart. Every time I visit Wal-mart, I'd walk by the photography section. This time, I didn't have to coerce my wife. Because we haven't done leisure shopping for years, we were both more than happy to go aisle-to-aisle. One unique feature of Wal-mart's photo section is that you can find digital cameras for less than twenty bucks. Now, these cameras aren't any good compared to my professional equipment. So why would some one like me want one of these "bad" cameras? They are affordable for me to keep one in each car. They are tiny and truly able to go anywhere. Photos from these cameras may become a cult artform much like what Holga has done for photography. They are fun to play with. Whatever the reason, I just enjoy creating photographs with any equipment I can get my hands on. 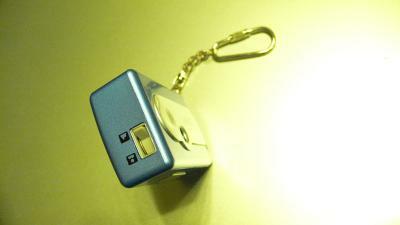 So when I saw this cute, miniature digital camera that has a SD Card slot, I was thrilled! The camera is the VistaQuest VQ1005 Digital Camera. I found that the SD Card slot can read and write FAT (FAT16) format. If you insert a card that is formatted to FAT32, the camera will automatically format it to FAT16; you will loose all your data on the card. I've lost some data that way. 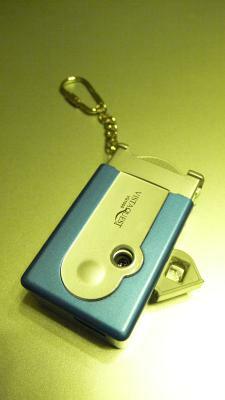 The VistaQuest VQ1005 is a 1.3 megapixel digital camera. It shoots 1280x1024 images on its CMOS sensor. It is able to digitally interpolate images to 640x480 and 1600x1200. The 1.3 MP photos faired much better than I expected. The images are quite useable and are quite charming to look at. It even has the ability to capture videos. The video has a maximum resolution of 320x240. The maximum size per clip is 2.4 MB, which translates to about 40 seconds. 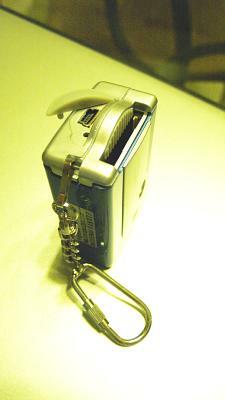 This digital camera also supports web cam mode when connected to the computer via the included USB cable. In web cam mode, the camera can capture 320x240 at 20 frames per second or 640x480 at 12 frames per second. The software supplied only works with Microsoft Windows 98, ME, 2000, and XP. 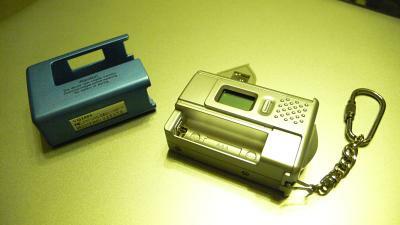 Physically, it is extremely small; smaller than any other digital cameras that I have seen before. 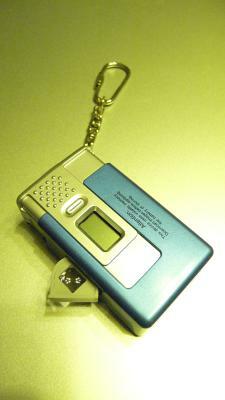 Due to its smallness, it has no LCD for viewing pictures. It only has a very small LCD for camera operations. While using this digital camera, I couldn't review the pictures right away. It reminded me of the film days. I remember watching the movie, "Forest Grump". Forest's mother told him that life is like a box of chocolates; you never know what you'd get. I use to feel the same way with a roll of film. Now, I feel the same way with this camera. The camera has only two buttons. The mode button is for navigating through camera features. It is located to the right of the LCD. The mode button scrolls through the following features: normal resolution, low resolution, high resolution, video, self-timer, burst, delete, and format. The shutter button is for selecting feature and firing the camera. At Wal-mart, I've noticed four different colors for this camera: blue, pink, red, and black. I preferred the blue. The blue cover serves as a case for the camera. When you slide the camera into the case. It hides the camera lens and the viewfinder. Viewfinder is practically useless for this camera. I haven't framed anything correctly with the viewfinder. I have better luck eyeballing. The VQ1005 has a fixed focus lens. The focal length is 9.6 mm. Aperture is f/2.8, quite excellent for an inexpensive digital camera. I suspect that aperture is fixed and exposure adjusted via shutter speed. And the camera offers a lens focus switch that can switch between macro or landscape. Macro is used for objects 2 to 6 feet away. Landscape is for objects greater than 6 feet away. The switch is not discrete, so I wonder if setting the switch in the middle would change the focus range. The camera does not have a zoom lens or a flash. I notice that it exposes the scene adequately in low-light, indoor situations. Because this camera uses SDRAM, the memory has to be refreshed even when the camera is off. Therefore, it's really on all the time (even if you turned it off). If you turn the camera off, then you have 3 seconds or 3 minutes (the user's manual mentions both) to change its battery before it's memory is erased. If you forget to turn the camera off first, and remove the battery, the memory is erase immediately. I bought the camera last Thursday. Today, Monday, the battery is too low to shoot any pictures. The included alkaline battery lasts about half a week. I think rechargeable NiMH AAA battery is the way to go. If you keep this camera in your car, keep the alkaline battery out of the camera until you want to shoot. And keep a pack of AAA batteries in your car. Battery installation is not intuitive at all. I couldn't find the battery bay until I read the instruction manual. It instructed me to slide the cover off by pushing the viewfinder down. I am almost tempted to leave the cover off altogether. But the cover is very cute. So far, the VistaQuest VQ1005 is the best digital camera available for twenty bucks!